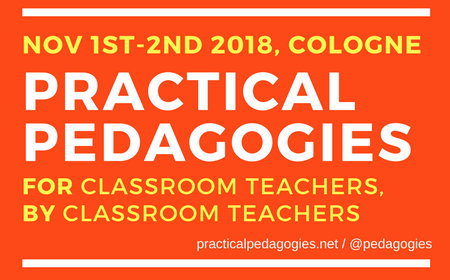 Following on from the success of Practical Pedagogies 2015 and 2016 at International School of Toulouse, the third Practical Pedagogies conference is on the move to Cologne, and specifically St George’s International School. I have been fortunate enough to be invited to speak at both Practical Pedagogies so far – in 2015 about Using technology to enhance Primary Language Learning and then, after my sketch noting caused interest, in 2016 I delivered a workshop on Sketchnoting for Beginners and also sketch noted the conference. I was dismayed when I discovered that IST was unable to hold the conference in 2018 as it is such an amazing event. Fortunately, my dismay and disappointment was short lived as a new plan was hatched and it’s all systems for November 2018 in Cologne. At this stage, the programme has yet to be set and Russel Tarr, Practical Pedagogies mastermind and the man behind Classtools and Active History, has issued a Call for Presenters. He told me today that there have already been 120+ ideas submitted – including one of mine! – and that there’s still time for more. The deadline for submission is 31st January and I’d encourage you to apply if you have an idea. It doesn’t have to be primary language related – it’s a conference for anyone involved in teaching and at whatever level. It’s international and one of the things I love most is being inspired by educators from around the world who teach in other educational systems, under different ‘rules’ and circumstances, and discussing with them how they experiences can be applied in other contexts. If you do want to submit an idea, you can do so via this link to the Practical Pedagogies site. Once all the submissions have been reviewed, a programme will be drawn up and booking will open in March! The advantage of being a speaker is that you get to attend the conference for a highly reduced price (50 euros but you get your restaurant meal on the first night paid for which would cost that, more or less!) and you get your foot in the door before anyone else. Plus speaking at Practical Pedagogies is a great experience! This year, I’m really pleased that it’s taking place during half term so I won’t need to beg to be released from school if I’m chosen to speak – and I’ll get to visit Germany and try out my developing German! So go for it – nothing ventured, nothing gained and then, fingers crossed and thumbs pressed!